Most up-and-coming politicians are coy when asked about their political future, but Cory Booker couldn’t have been more eager to announce on Sunday's "Face the Nation" that he was “absolutely considering running for governor” of New Jersey. The very next day, the Newark mayor declared that New Jersey’s incumbent Governor Chris Christie was “vulnerable,” even though recent polls show Christie’s approval ratings approaching 70 percent in the aftermath of Hurricane Sandy. Surely Booker wouldn’t take to national television to muse about his prospects in a potentially epic contest without some optimistic reporting from his advisors, who know as well as anyone that the key to victory is as simple as it is challenging: win Democrats. Booker’s opportunity and Christie’s vulnerability are based on one important, obvious fact about New Jersey: It’s a blue state. Obama won it last month by 18 points, and the exit polls showed that 44 percent of voters identified as Democrats, a formidable18-point advantage over self-identified Republicans. While that margin is probably lower in an off-year electorate, a Republican candidate in New Jersey needs to win about 20 percent of self-identified Democrats and a similar percentage of voters who cast ballots for Democratic candidates in presidential elections. That's why Republicans struggle in statewide races: No GOP candidate has eclipsed 50 percent of the vote in a gubernatorial, senatorial, or presidential contest since George H.W. Bush in 1988. Prior to Hurricane Sandy, polls showed Booker close to Christie in a hypothetical matchup. An October Quinnipiac poll had Christie with a four point lead, 46 to 42, but Booker’s path to 50 percent was pretty clear. Most undecided voters were Democrats, women, and black, so it was easy to see how a popular Democrat with an extraordinary 52-13 favorability rating would win an outsized share of the remaining voters, especially with 35 percent of voters still not knowing enough to formulate an opinion of Booker. After Sandy, the question is whether Christie’s post-hurricane popularity can overcome the state’s partisan make-up. Recent polls show Christie with an impressive approval rating around 70 percent and big leads against some possible Democratic challengers. Christie’s strong ratings are driven by big gains among New Jersey Democrats, with approximately half of Democrats approving of Christie’s performance in recent Quinnipiac, PPP, and Rutgers surveys. And Democrats don’t just approve of Christie, they’re willing to vote to re-elect him against certain opponents: More than two-fifths of Democrats say they would support Christie against lesser-known candidates like Lou Greenwald or Barbara Buono, who entered the race earlier today. But Christie isn’t converting his high approval ratings among Democrats into the same level of support against the more popular Booker. The three post-Sandy surveys show Christie at 50, 53, and 53 percent of the vote in a hypothetical match-up against Booker, giving him a big lead over Booker's tallies in the mid- to upper- thirties. 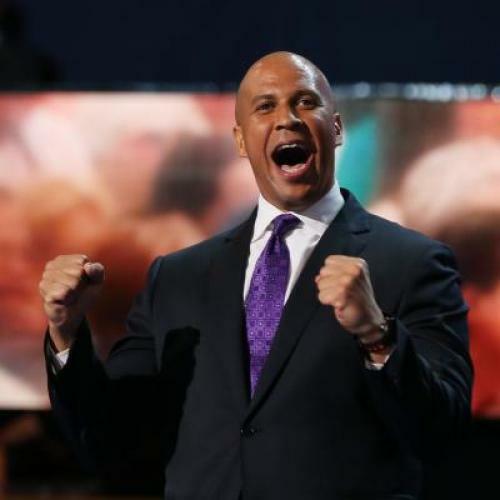 But most undecided voters are Democrats or Democratic-leaning independents and the reluctance of 47 percent of New Jersey voters to support Christie at the peak of his popularity suggests the potential for a close race, should Booker run. Nonetheless, 53 percent is good enough for victory, and usually an incumbent at 50-plus percent of the vote wouldn’t be considered especially vulnerable. If he has serious presidential ambitions for 2016, Christie might be reluctant to endanger his conservative credentials by moving left, making it harder for him to assuage the concerns of moderate New Jersey Democrats. Christie's personal popularity gives him plenty of leeway against less appealing Democratic opponents, but a nationally known Democrat like Cory Booker who can win over Democratic-leaning swing voters might be able to turn the campaign into a referendum on Democratic wedge issues. Given that many more Democratic voters refrain from embracing Christie in polls that specify Booker as the alternative, one wonders whether the possibility of a close race comes down to whether Booker fulfills his own promise. If he proves as formidable as glowing national coverage makes him seem, then it's easy to imagine him attracting the Democratic-leaning voters necessary to contest a close election worthy of its billing.